Gel paint kit gives you the tools and instructions to create your own color tones. After 18 years in the Human Relations field, June Sierra decided to become a nail tech. Razzle dazzle your clients with an invigorating pedicure and massage using raspberry and eucalyptus-peppermint scented products. A guide that is needed for every nail tech when choosing nail files. The Hive of Beauty Spray Paraffin Therapy System uses a spray-on application to soften and condition hands. Nails by Carmen DeBellis, Carmen’s Nail-Tique, Saginaw, Mich.
Nails by Kim Carraghan, Elite Styling Salon, Coplay, Pa.
Light Elegance’s new Gel Paints create nail art with a bold look and fine touch. 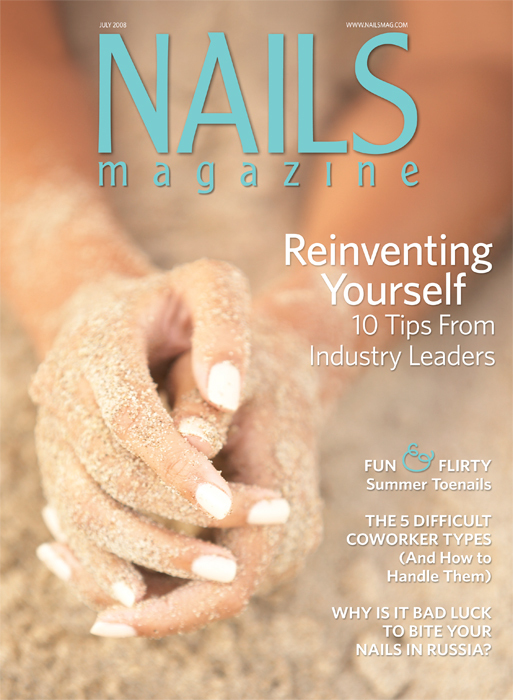 Protect your nails from harsh UV rays that can cause fading and yellowing. Nail tech Elise Pilkington became the overall UK Champion for 2008. Reader to Reader: Is having a salon website a must in today’s environment? Is having a salon website a must in today’s environment? Salon success handbook advises it is important to develop a working relationship with trainers in the industry. On My Mind: Are You Focused? There’s no question workplaces have become more casual, but not all traces of professionalism have been erased. How do you maintain your professionalism when your personal life has become difficult? The challenge for techs is in knowing where to draw the line between personal and professional when the two are so closely connected. The sun-drenched days of summer are here, and along with them, harsh UV rays. This month, we lay out an assortment of SPF products that clients can use while they enjoy the outdoors. Salon consultant Bryan Durocher of Durocher Enterprises offers a way to make opening a dialog with clients just a little bit easier. Those nails you’re working on today may bring you more than your weekly wages. In cultures around the world, there are (or were) superstitions about the good, the bad, and the ugly those nails can bring a person. Here is a sampling of some global nail superstitions and beliefs. On the Road: Sugarcoat, Atlanta, Ga.
Sugarcoat: A Nail and Beauty Bar in Atlanta’s Buckhead neighborhood stands out amongst the other boutique, upscale, and discount salons in the city because it’s developed a unique brand that’s reinforced through every aspect of its business. Fleur de Lys in Portland keeps it simple, cozy, and consistent. Michael Megna, CEO and co-founder of Backscratchers Salon Systems, discusses salon sanitation issues and the trend toward disposable products. Tips on making a steadier polish application so your clients will know you're a pro. Garden of Eden, instead of an apple.